You are visiting the "War Dogs" page. The links with asterisks in front will return you to either the parent or "Home" pages. Click on any thumbnail size image below to enlarge it, then click on your browser's back button to return to this page. During the preparation of this website, it was learned that numerous sheep dogs and collies were enlisted by the British Military during World Wars I and II. 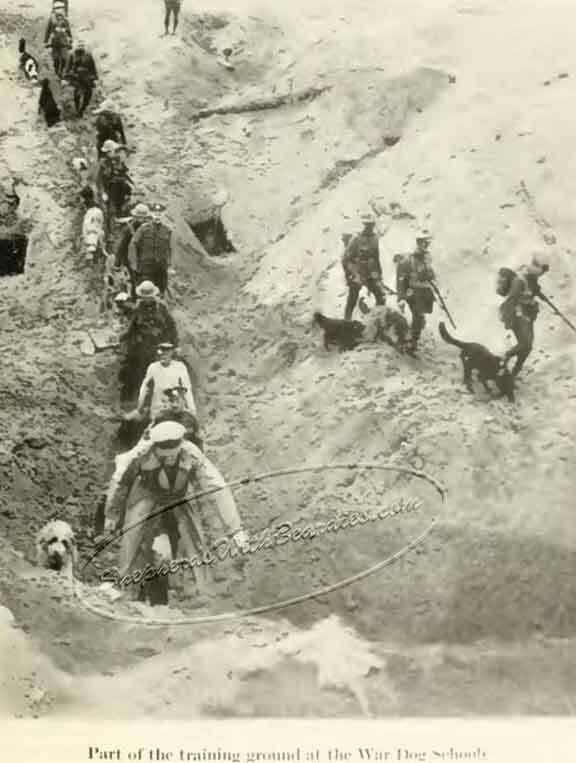 The below image was cropped from an official British photograph showing how the messenger dogs were billeted behind the front-line trenches. It seems that those dogs were Beardie-like canines. One of the dogs seemed to be wearing a bandage on the face. 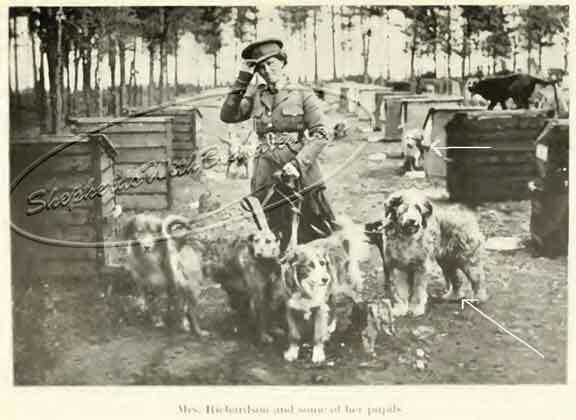 In the next photograph,we see many dogs were called upon to serve their countrymen. This image is under copyright. Do NOT reproduce. 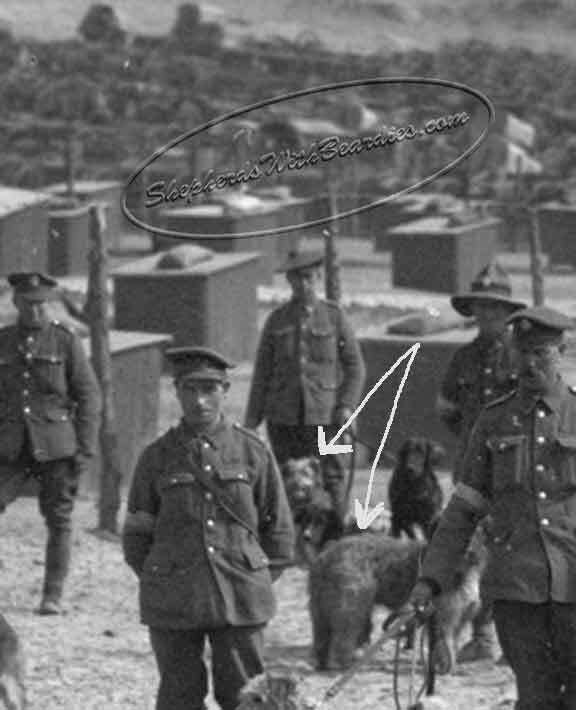 In a magnification of a portion of the Imperial War Museum photograph, two Beardie-like dogs appear to have been recruited. 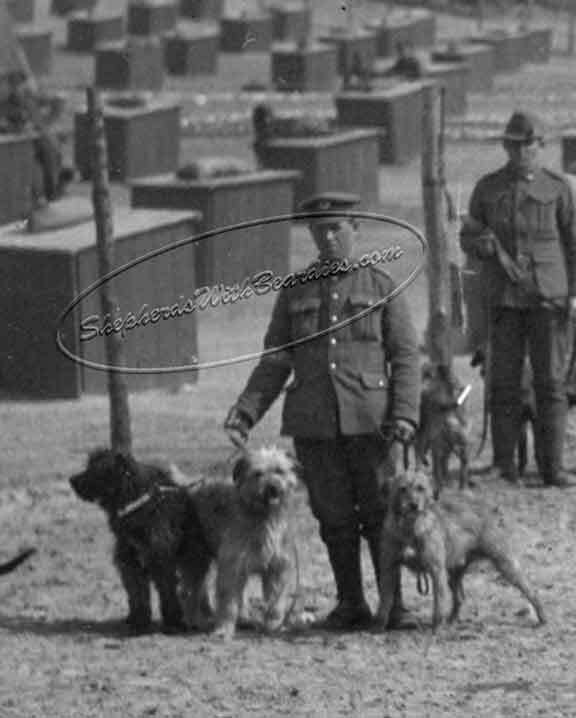 In another magnified portion of the Imperial War Museum photograph, two arrows are drawn pointing towards two other Beardie-like dogs. 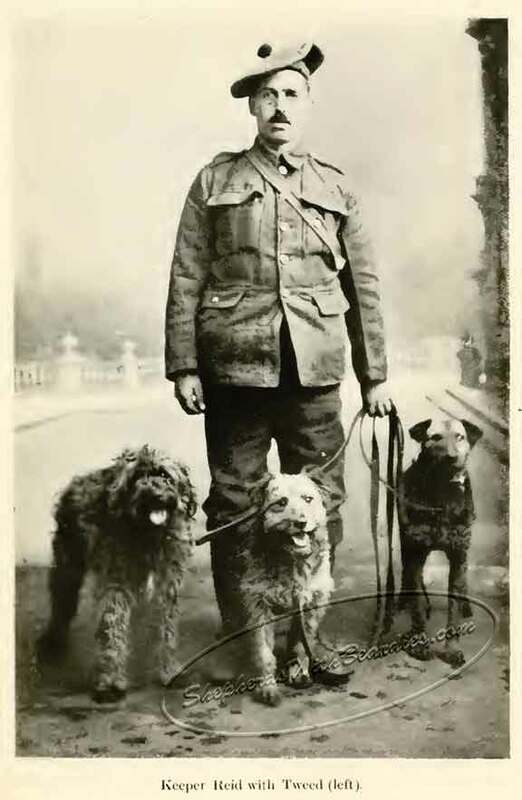 Lt. Col. E. H. Richardson, was the Commander of the British War Dog School during WWI. His book, British War Dogs: Their Training and Psychology, tells the reader a great deal about the dogs. "The sheep dogs, and by this I mean the shaggy or Highland variety, frequently make good dogs. They are sometimes rather highly strung, and for that reason their training takes longer and requires great patience, but if one can overcome their tendency to nervousness, they are naturally extremely intelligent and conscientious workers." 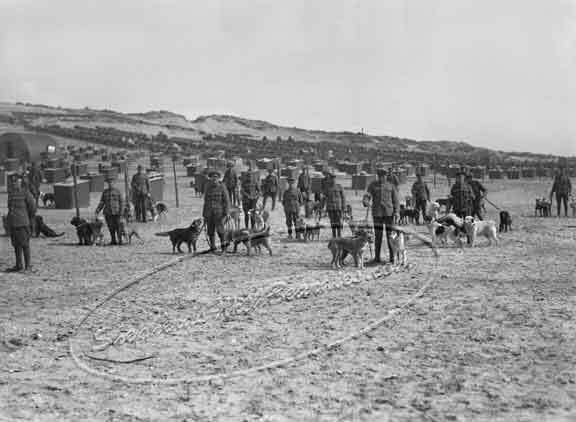 Richardson wrote on page 97 about a dog named "Tweed" who was sent forth by Handler Reid to deliver a message during battle. The message stated "Send up reinforcements and small round ammunition." Richardson related how Tweed made three runs at night, and one of those runs he was "out on patrol." He was sent back from the front to deliver a message that indicated "The Germans are preparing for a raid." "The dog "Tweed" mentioned in the above statement performed some wonder services. He was a Highland sheep dog, and took rather longer to train than usual, owing to his highly sensitive nature, in fact he was nearly rejected altogether, and it was only through the urgent representations of Mrs. Richardson, who discerned "Tweed's" fine character through his shyness, that he was retained and his training persevered with. Patience and great gentleness in handling eventually overcame his reluctance and timidity, and the clever management of "Tweed" in the field by his keeper brought this dog up to a very high standard. We are so fortunate to be able to see Handler Reid with Tweed (left side of photograph). He certainly fits the description of a shaggy Highland sheep dog. It is not known if the shaggy sheepdog to the left of Mrs. Richardson (right side of the photograph) was Tweed or another Beardie-like canine. If you look closely, another Beardie-like dog can also be seen coming out of his kennel. A white arrow pointing to this dog was placed on the image to assist the viewer. 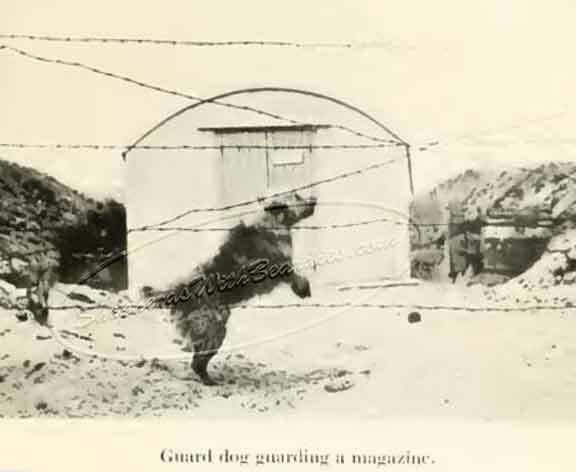 The below image may be of another Beardie-like dog in action while guarding an area where magazines (assault rifles) had been placed. In the below image, the lead dog appears to be another Beardie-like dog. 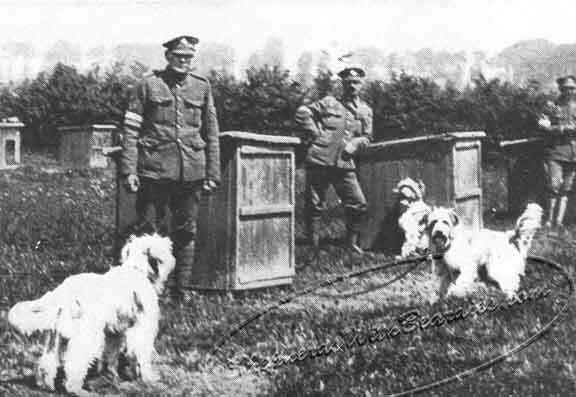 These dogs were being trained on how to work on the ground in trenches. The last dog in the line (upper left hand corner of the image) can barely be seen, but this dog also appears to be another Beardie-like dog.